Windows 10 is the best Windows yet, and at Microsoft, we are excited to deliver innovative Windows 10 experiences across a wide variety of world-class devices. Get the most out of Windows 10 with innovative hardware form factors that boost user productivity while reducing security risks—delivering more value at every price point. 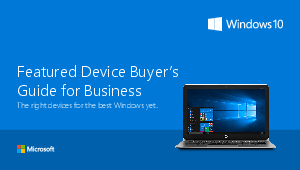 Download this buyer's guide to discover which Windows 10 Pro devices are right for your business.